Just because the summer’s gone, it doesn’t mean you have to retreat inside just yet! As Canadians, we know that with a few warm layers and a comfortable, cozy ambience, we’ll embrace any time of the year outdoors. And with the array of stunning colours all around us, it’s always refreshing to soak up those sunny, crisp autumn days and evenings outside. So before you pack up your patio furniture, here are a few easy ways to make the most out of your backyard post-summer. As your plants and flowers begin to taper off and wilt with the cooler weather, you can easily spruce your garden back to life. Adding some potted mums and plants that can tolerate the cooler weather can give your garden the perfect splash of colour to embrace the fall atmosphere. 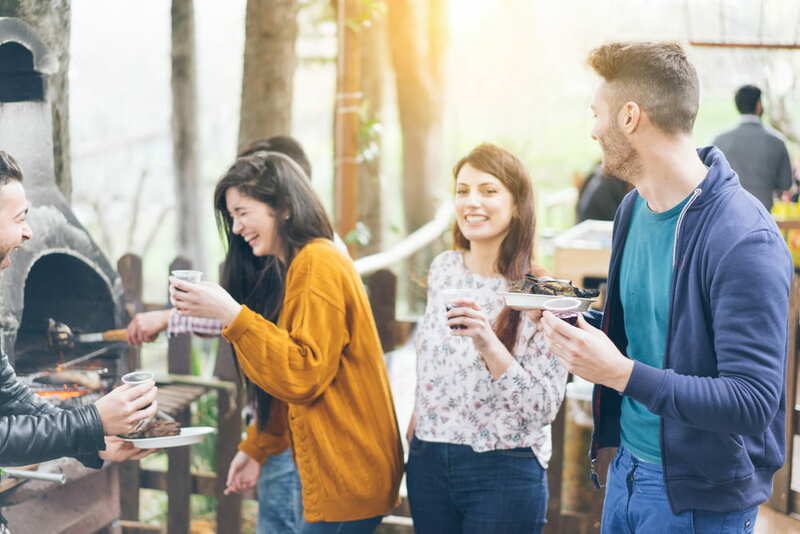 Most of us love to get outside to indulge in (what’s left of) the pleasant weather, but there’s often not much of an opportunity to enjoy it with friends and neighbours. With some warm layers, good music, and great company, you’re guaranteed a good time. And, since backyard get-togethers aren’t as common during this time of year, you have a much better chance of getting people to attend! If you have an outdoor fire pit, light it up, grab your marshmallows or your favourite warm beverage, and spend some time relishing in those crisp, clear autumn evenings. Space out and star gaze, catch up on your latest book, or invite your friends to join as you curl up and stay nice and toasty. Having a backyard fire pit is a fun way to extend the use of your backyard and stay comfortable as the temperature starts to cool off. If the cooler temperatures are preventing you from utilizing your backyard (and you don’t have a fire pit), you can still make it cozy! By adding thick throws, plush pillows and stringing up lights with warm hues around your seating area, you’ll be surprised at how much more warm and inviting your patio or backyard space will be. If you have a few candle lanterns, add those too. Just because your neighbours have closed up their pool and yard for the season, it doesn’t mean you have to pack it in once the summer is over. The fall is an incredible time of year to be outside to relish in the beauty of the season. So make the most out of your backyard by making it cozy and comfortable this fall.